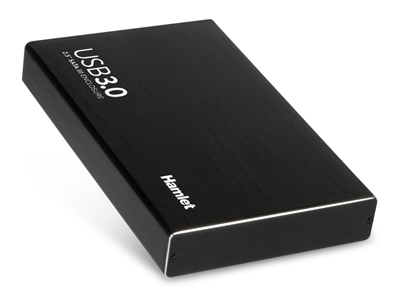 Hamlet USB 3.0 Tera-Station SATA III is an external hard disk enclosure equipped with USB 3.0 interface that can accommodate a 2.5" SATA hard drive (HDD) or solid state drive (SSD) up to 15mm thickness for maximum storage capacity. The USB 3.0 interface allows data transfer rate up to 5 Gbps, 10 times faster than USB 2.0, and makes Hamlet USB 3.0 Tera-Station SATA III the ideal portable solution for data storage and backup. N.B. The enclosure is only compatible with 5V powered hard disks. HDDs with 12V or 5V dual voltage power requirement are not supported.